Out and About: Dining Out with Studio Basic is a delicious addition to the 'get-out-and-explore' themed collection. 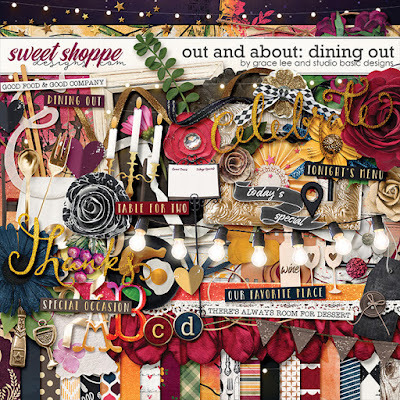 Sumptuous, rich reds, blues and golds, combined with gorgeous patterns and a little mood lighting to fashion an atmosphere perfect to create stunning journal and scrapbook pages about those intimate dinners for two, a sophisticated but fun girl's night out or perhaps a special family occasion. and 95 delectable elements. The elements included are: 3 bows, 3 buttons, a candle stick, 2 wine charms, a dish of food, 13 flowers, 3 pieces of foliage, a fork, 8 frames, a chalkboard, grapes, 3 sets of lights, a painty mark, 5 ribbons, 2 scatters, a spoon, a chandelier stamp, 4 pieces of string, table for 2, 3 tags, 2 trims, 2 ampersands, a banner, a bunting style banner, 2 yummy mixed media brushes (each in 2 variations), chop sticks, a piece of ephemera (2 variations), a piece of film, a geotag, 3 hearts, a leaf, a menu stand (2 variations), a rosette (2 variations), a veneer wine bottle and glasses, and 11 word arts.